Mission-driven foundations invest up to 95% of their assets to fund their grantmaking work. But many don’t realize those investments may be working against their organization’s mission. Foundations can amplify their efforts through impact and place-based investing. Most foundations disburse only a small fraction of their funds to grantmaking each year. The bulk of their assets (typically 95%) is invested, sustaining a foundation’s grantmaking year after year. Since traditional investing disregards social or environmental impact, a foundation’s investments may actually be working in direct opposition to its values. Aligning invested assets to a foundation’s mission ensures congruence and broader impact without threatening the foundation’s financial vitality. Impact investing—“investments made with the intention to generate positive, measurable social and environmental impact alongside a financial return”1—offers foundations an opportunity to align investments to their mission and amplify their positive impact. Despite decades of evidence to the contrary, a misconception persists that mission-aligned investing comes at the expense of financial returns. In reality, impact funds perform much like traditional investment funds. In 2012, Deutsche Bank conducted a landmark review of some 2,200 studies over 40 years. According to the authors, “the results show that the business case for ESG investing is empirically very well founded. […] Roughly 90% of studies find a nonnegative ESG–CFP (corporate financial performance) relation. More importantly, the large majority of studies reports positive findings.” In short: careful analysis has, time and time again, shown that business, societal, and environmental interests can move together. Particularly when investors take a passive approach, impact investments match or even outperform traditional passive investment funds and ETFs. The first socially responsible ETF, launched in 2005, currently holds $11 billion in assets and has realized 200% growth over the past decade.2 Its performance is not unusual, which is why the Nathan Cummings Foundation recently aligned 100% of their nearly half-billion dollar endowment with their mission. Impact investing has been recently associated strongly with private placements and fixed income. However, most foundation endowment pools are primarily invested in public equities, where they can gain strong returns and broad diversification at low cost. Fortunately, new tools have made it easier to align public equities asset allocations directly with organizational values, while realizing real and tangible impacts, at low cost. Suppose an organization is dedicated to cleaning up waterways and the local environment in the Chesapeake Bay Area. It can now remove the major polluters in which its endowment is invested, and tilt those funds towards climate leaders and companies that are lifting up the local economy. The organization can take this a step further and engage in relevant shareholder resolutions with those polluting companies. And it can track and report to its donors and staff the tangible impact of both its day-to-day activities and of its investments on the Chesapeake Bay. Conscious investing is indeed impactful. 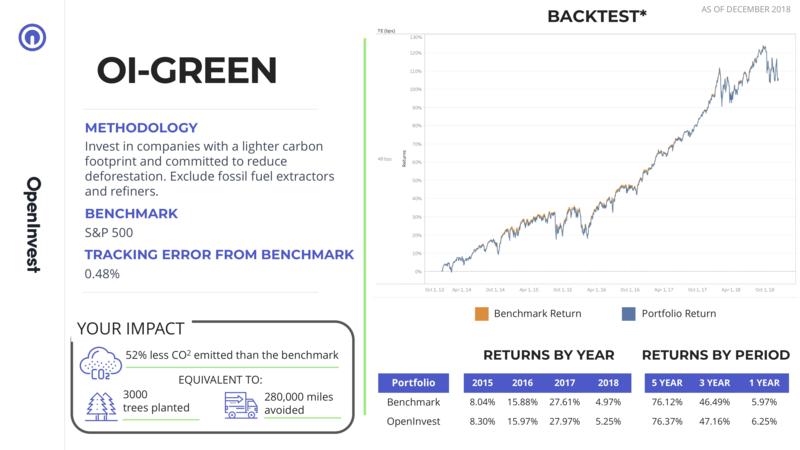 OpenInvest’s carbon-efficient strategies, for example, are about 50% less carbon-intensive than a standard index fund. Meanwhile, place-based investment strategies can provide some of the most tangible results, with impact occurring directly within a foundation’s community. Finally, the collective impact of impact investing can actually change the way companies do business. Foundations who shift to impact or place-based investing ensure their assets work with–not against–their values and community. Impact and place-based investing enhance social and environmental impact while offering the same benefits of traditional equity investing, including diversification, liquidity, and convenience. Furthermore, they can do so at no greater cost while earning market-rate financial returns. *Performance graphs and other historical information are not a guarantee of future performance, and the future performance of a portfolio/allocation or recommended security may differ materially from its past performance. Case studies selected for illustrative purposes only and may not be representative of a Client’s experience with OpenInvest. Returns in backtest charts and return tables are presented gross of fees. OpenInvest’s ESG analysis is dependent on the reliability of data from third-parties. The effectiveness of the platform may vary if such third-party data sources become inaccurate or unavailable. Impact metrics are calculated based on a $1 million investment over 1 calendar year. Newsletter Every two weeks best articles straight to your inbox - no spam! Learn more about OpenInvest Let's go! The Glass Ceiling at 40 Years: Are We Letting Women Lead? Financial Fridays: What is ESG? What Is a Financial Advisor – And Do You Need One? Financial Fridays: What Is Return?